Arkhad "Thorny" Ramathorn (Jay Chandrasekhar) is a veteran of the Vermont State Troopers who is more or less the second in command in his station. Robert "Rabbit" Roto (Erik Stolhanske) is the newest addition to the force. MacIntyre "Mac" Womack (Steve Lemme) is the trooper who enjoys pranks the most. Jeff Foster (Paul Soter) is arguably the calmest and most reserved trooper of the force. Rodney "Rod" Farva (Kevin Heffernan) is fat, loud, obnoxious and arrogant. 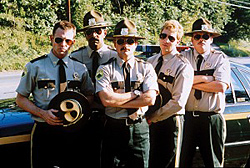 Captain John O'Hagen (Brian Cox) is the captain of his Vermont State Troopers station. He acts as a mentor and father to his troopers and tries his best to keep the station from being cut from the budget. He is a two-time boxing champion in the Navy and is derided by Farva for his choice in dress as wearing a “Canadian Tuxedo”--an outfit made completely from denim. Brian Cox is also the only actor to play a Trooper who is not a member of Broken Lizard.